Hope everyone is having a great, not too wet, start to our Golden Jubilee celebrations! I’ve been looking forward to the long NDP weekend all week. We caught a fleeting glimpse of the RSAF Black Knights before the aerial show ended early, lunched at MBS and snacked at the nearby home cooked food fair (tip: don’t bother). We’d also planned to visit the Art Science Museum but the queues were just too long. Still, that and the rain didn’t dampen on our spirits as we found other ways to celebrate while being thoroughly drenched! Home and a bright future. We relocated here 8 years ago from the US, and friends and family from all over the world would often visit or transfer in and out due to work. One day, I realised that hubby and I had stopped thinking about Singapore as a place to “transit” but one that we truly wanted to raise our family in, stake our careers on, and play our small part in nation building too. 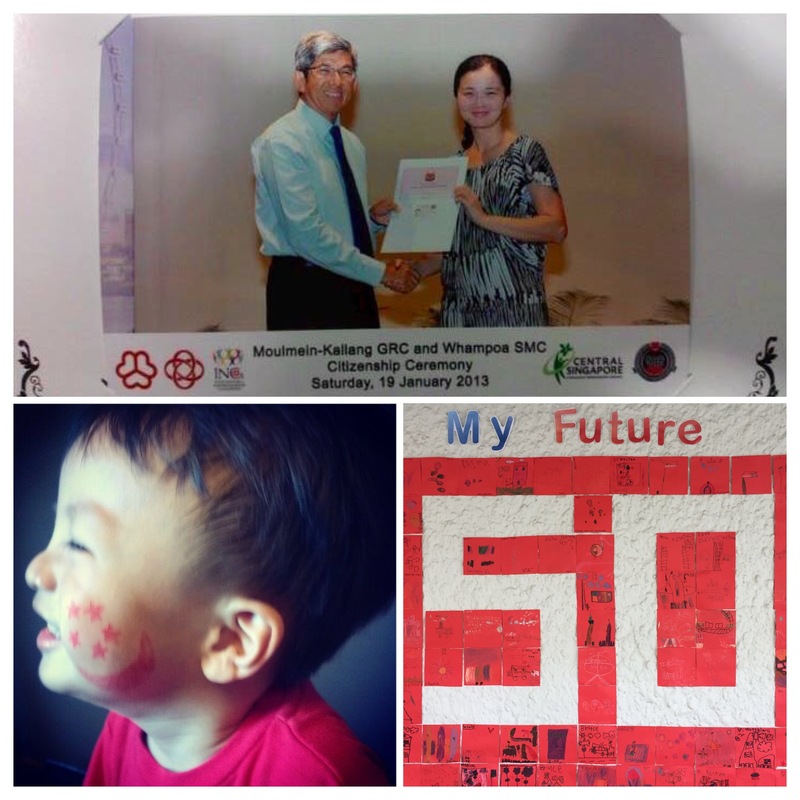 So I took up Singapore citizenship 2.5 years ago – and look forward to what lies ahead. Little Green Dot. 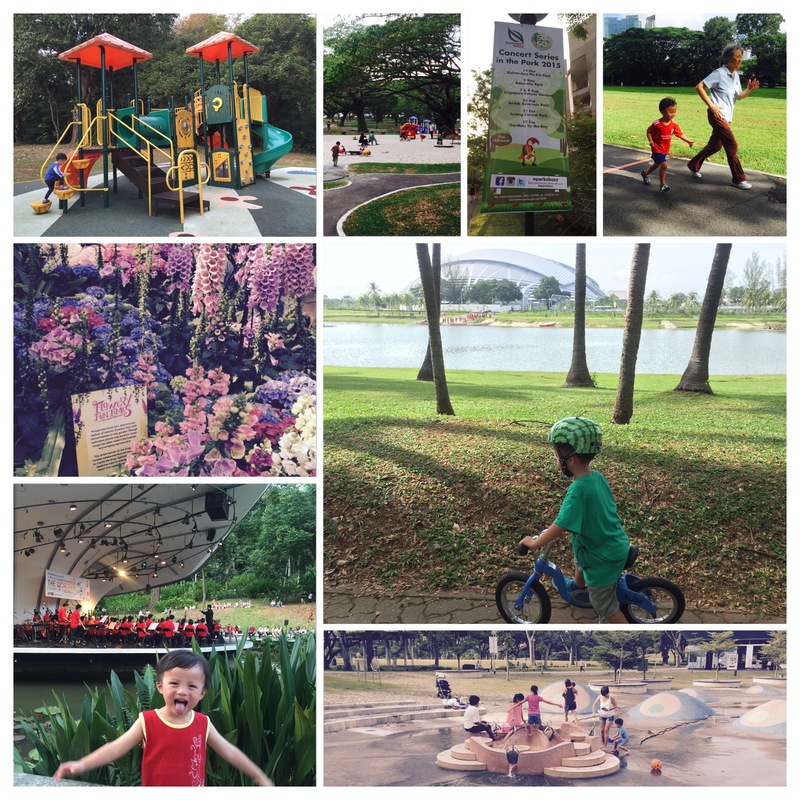 Growing up in Malaysia, Singapore was always perceived as the “atas” neighbour that was so lucky to have many parks and tree-lined roads. Today, from its freshly minted UNESCO World Heritage Site, the Singapore Botanic Gardens, to the ubiquitous sky-rise gardens, park connectors, nature reserves and neighbourhood parks, Singapore’s delightful and thoughtful approach to urban development has benefited residents and visitors alike, and inspired fans worldwide. What’s more, these are all FREE public spaces despite the immense effort in creating and maintaining them. So thank you, NParks, the late Lee Kuan Yew and our leaders for setting Singapore on a transformational path that started from the 1960s to become a Garden City and now, “City In A Garden.” What a living example of 前人种树, 後人乘凉 (“one generation plants the trees, the later generations enjoy the shade”). Haven for multiple generations. Since making Singapore our home, we’ve also encouraged my overseas parents and siblings to not just visit, but consider staying on as longer term residents. Many cities don’t fully support the needs of a multi-generational family, with its complex mix of jobs, education, healthcare, transportation, security, social, emotional and physical needs. IMHO, Singapore meets and balances those demands better than many other countries. While not perfect, the government also constantly monitors changes and tries to make improvements on the quality and cost of living, childcare, eldercare, the school system and public transit, and has also acknowledged the role grandparents play in the decision to have (one or) more babies 🙂 Our lives have been so much richer and busier, with three generations in our family to care for each other and make memories together. So, whether you’re Singapore born, a naturalised citizen, a permanent resident or just a visitor in “transit”, if you call Singapore home, this “What Singapore Means To Me” blog train has a stop for you. Hop on the MRT by adding your links below and include the blog button (copy the code) in your post. Majulah Singapura! Next on the train is Jenn, who blogs at mylilbookworm. This is where she documents her thoughts on educational, parental, health and investment topics. Check out her blog post on what Singapore means to her and how she spent her National Day long weekend! For more updates, reviews and giveaways, follow Finally Mama on Facebook and Instagram. What a lovely and thoughtful post! Happy SG50! Looks like everyone was at the Marina Bay area last weekend – I guess, being united in that moment is reason to celebrate! I like what you say: “we truly wanted to raise our family in, stake our careers on, and play our small part in nation building too”. Lovely. We throughly enjoy ourselves this jubilee weekend. While we enjoy all the festivities, we reflect on how Singapore has changed so much over the past 50 years and how blessed we are to live here and having our home here. Thank you for initiating the blog train! It gave me an opportunity to reflect what Singapore means to me! My hubby is a naturalised Singaporean too. Born and bred in Penang Malaysia, he left for studies in Melbourne before settling here to start a family. He always say that having experienced racial discrimination in his own birth country by the govt, he only wish Singaporeans would appreciate the country more. What a meaningful blog train, love your blog button! I’m from Penang too. Totally agree – us “new” Singaporeans probably have deeper appreciation of this country than some others…. We lived in the US and in Europe for awhile too but there was no where like home – Singapore, safe, secure, beautiful and even though costs have gone up, it’s still more expensive elsewhere, so why complain when life is way better here. Glad you made Singapore your home. haha! So true! Suffer overseas and then they’ll know! LOL! Thanks – look forward to reading yours! It’s always refreshing to see how new citizens view Singapore. Great choice to stay here.